last decade, but what does it mean? Equipment manufacturers include a basic program used with multi-function devices that simply monitors volumes and includes toner replenishment. This achieves a small reduction in toner cost. At Omni, we dig much deeper into your business process to find more efficient ways to meet your document needs. Our process may include right sizing printer fleet or reallocation to meet lower cost and green initiatives. We also help you implement industry leading security and compliance measures to reduce risk and protect your data. We will conduct a no obligation comprehensive evaluation of your print environment, document infrastructure and workflows. This will give you an accurate baseline of your current printing utilization. Then we will develop a roadmap for your ideal future state, including cost saving projections. Transition from your current state to your ideal future state design with our Managed Print Solutions. We will also help connect everything to your IT environment in a secure and compliant way. With our solutions for secure printing from mobile devices we assist your IT team in taking over the responsibility of managing your print inquiries and print servers. We will assist managing the day-to-day operations of your print and document infrastructure. Through ongoing data review and analysis we’ll help you continue to improve productivity and the end-user experience. We can also help you to automate paper-based processes, with the goal of further enhancing productivity and cost savings through reduced printing. Learn where your print system can be consolidated and updated. We work with you to simplify and replace your existing hardware. Omni’s Discovery Process starts with a very thorough assessment that covers 6 critical components of your company’s document management procedures. Our clients have shown us that these components have a direct effect on a company’s bottom line by giving them better control over hard and soft costs. The findings of our assessment are vitally important to our clients, as it is an accurate snapshot of their current environment. This enables them to make informed decisions during the Control Phase of Omni’s Managed Print Services strategy. Our expertise has been developed over the 45 years of our success as a funding source and solutions provider. Through our business evolution Omni has achieved top tier relationships with the major manufacturers as well as the top software solution developers in the document management industry. We continue to maintain an independent status that gives us the unique ability to deliver an unbiased assessment. Being in this industry and working with thousands of clients allows us to fully understand the importance of meeting or exceeding your service levels in order to keep your employees productive. Information is only useful when you know what to do with it! Each company should have a unique print system to fit their specific needs. During the Control Phase, Omni partners with our clients to create customized solutions to the issues that matter most to them. We do not take a “one-size-fits-all” approach. It is during this stage that we give our clients the tools to help regain bottom line profitability. Now armed with the information Omni gathered for you during the Discovery Process, we help you develop the strategies to create systematic rule-based printing procedures that are in alignment with how you need to run your business. Once we decide the best system for your company, we'll put it in place. Constant improvement is our goal. Keep your print system updated with Omni. 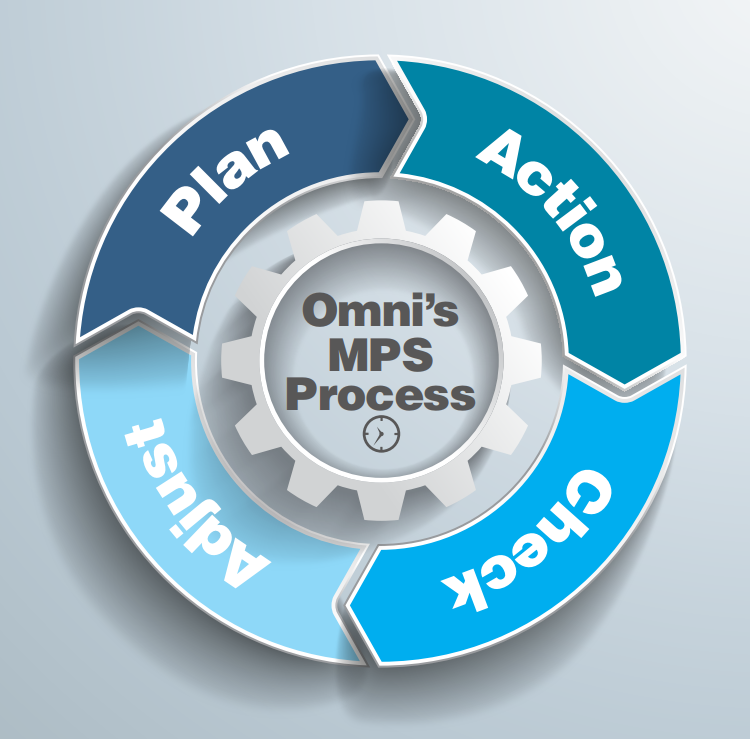 Omni’s Implementation is an ongoing process. We work with our clients through the 4 stages of the initial plan and beyond as we continually improve their processes and achieve the goals set forth. We listen to the objectives and processes our clients are interested in achieving and together we determine which important factors must be considered for a seamless integration with minimal impact to the their daily operations. We implement the best business practices for the fulfillment of our client’s plan. This is where we start to collect data for the ongoing analysis to ensure we are achieving our objectives. We study the actual results and compare against the expected results to ascertain any differences. Together we make any adjustments needed to maintain the new standards and workflow processes that our client’s have set. We keep working with our clients during the continuous process for overall improvement and profitability. Copyright © 2018 Omni Business Solutions. All Rights Reserved.